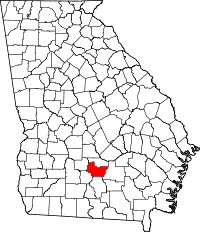 Irwin county is a diverse county. It is number one in the state in muscadine production and close to number one in blackberries, but row crops are also a predominant acreage in Irwin County. Farmers in Irwin County mainly plant cotton, peanuts, corn, tobacco, wheat and soybeans have been on the rise in the most recent years. For the last couple of years, Irwin County’s peanut acreage has been around twenty-two thousand acres, with some years having a little bit more. “With the new Farm Bill, we’ve seen our acreage go up,” states Phillip Edwards, Coffee County extension agent. “This year has been a tough year. We’ve had a lot of disease issues that have come on.” Peanut farmers in this area have also faced issues with spider mites in some dry-land fields and on dry corners of irrigated fields. The problem with these issues are not everywhere, but they are hit or miss for the farmers in Irwin Co.